The smaller of the 2 speakers I given for review is the Divoom Airbeat-10. 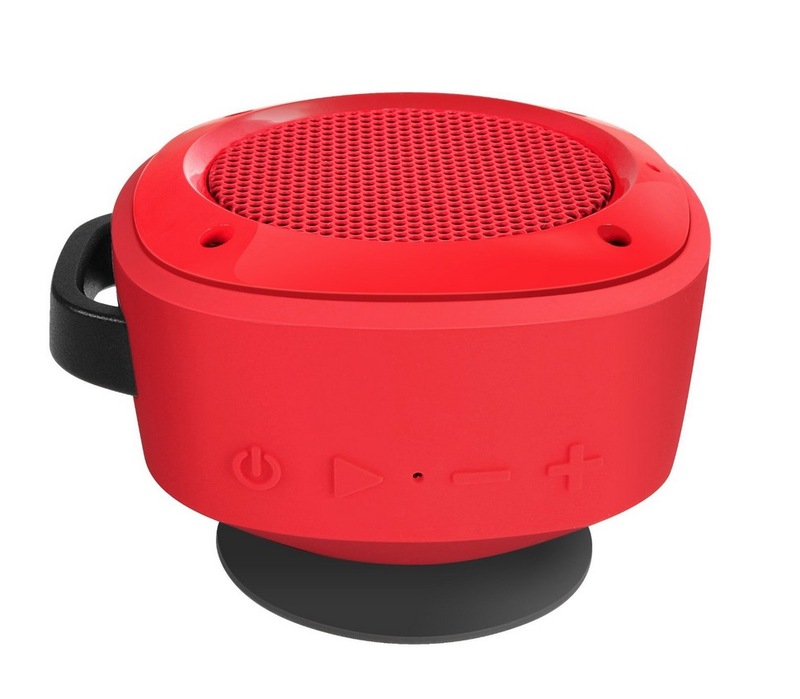 The interesting thing about this little guy is it’s weather proof/water resistant, so you can use it in the shower or outside without worry, and it comes with a built-in mic, so it can work as a hands-free speakerphone. It has 2 mounting options. The first is a suction cup, which is impressively strong when attached to a shower tiled wall. The second is a bike mount, so you can use it whilst you ride along, either to chat without having to have your phone out of your pocket… or to annoy everyone in the surrounding countryside by blasting your music out of it… Adding and removing the attachments is as simple as screwing them into the back with your hand, making it easy to switch between the different mounts. Charging is done via standard micro USB (charging cable included), and a full charge will last around 6hrs, with a recharge taking around 2.5hrs. Pairing was simple, and worked well with all the phones we tried, and sound-wise, it packs out an impressive noise given it’s small size. Sure, there are better speakers out there, but the Airbeat-10 is perfectly listenable, and has the added advantage of the rugged build and water resistance. The unit currently retails at £25 to £30. 8/10 – Rugged, versatile, and easy to use. Similar to the Airbeat 10, the Voombox ONGO is a weather proof/water resistant, bluetooth speaker, but a dual speaker set up rather than single. Also like it’s smaller counterpart, it comes with a bike mount, and has a mic, so will work as a speakerphone allowing you to answer calls. What you don’t have with this speaker is the suction cup option, I think mainly due to the fact it wouldn’t support it. Weighing in at 406g (over 250g more than it’s little brother), it’s still very portable, but heaver than you’d think looking at it. The sound quality is again fine, but nothing special over the smaller Airbeat 10. Charging is done via standard micro USB (charging cable included), and a full charge will last around 8hrs. The speaker currently retails at £35 to £50, but in all honesty, out of the two I’d probably go for the Airbeat 10. It’s smaller, and has comparative sound quality. The Voombox ONGO doesn’t really have enough going for it over it’s smaller cousin to make up for the extra cash. 7/10 – Good, but the Airbeat 10 beats it. ← Gambling games within video games!